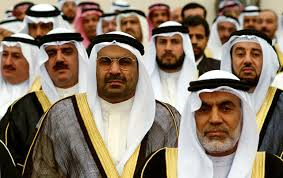 We are used to seeing the Kuwaiti dress code as pictured below. The Qatari dress code is a little different, the texture of the thobe is a little shiny with an angled collar, cufflinks and their agal has a tassel (karkusha) hanging from the end of it. I love the colors Omani men wear, they are so bright and stand out in a crowd and include a small tassel (furakha) hanging from the right shoulder. Some of the material used for their head covering (mussar) can be very expensive, they also wear a small hat (kuma) as well. Some of them wear a gold curved dagger (khanjar) around their waist, I love their style as white tends to be boring. Emirati men also love colors and are not afraid to wear every color of the rainbow, their 'kandura' has a tassel hanging down the middle. They have two different types of head covering, the long loose hanging one and then the wrap. 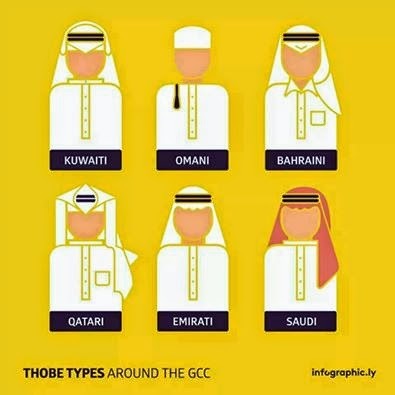 Bahraini are similar to Kuwaiti dress but the thobe usually has a row of buttons down the front. 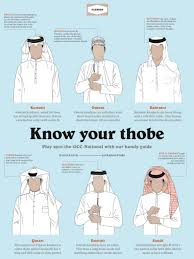 The Saudi men usually wear red/white ghutras with their collard thobes which tend to be a little tighter fitting. and people usually ask for anything that suits them so it could be custom made.i.e some Kuwaitis ask for a straight shape,others a wide shape at the bottom of the garment ,some ask for ask for a turkish style shape where its like an upside down cone ,the collar can be of any design some ask 1,2,3 buttons,some hidden,its stiffness varies ,long/short collars,pointy collars,the design of the chest buttons can be showing,folded or sometimes kuwaitis even have the buttons showing with a double folding inside so the actual folding is concealed inside(so no embroidery will be apparent). the colors usually tend to be white due to the heat but in the evenings and winter thicker fabrics and wider colors are worn.